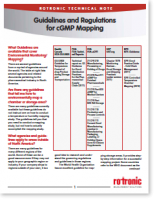 What guidelines for mapping temperature are available that cover environmental monitoring/mapping? Are there any guidelines for mapping temperature that tell me how to environmentally map a chamber or storage area? What agencies and guidelines apply to areas outside of North America? Why are there so many different regulations? Is there one regulation that supersedes all others? Wouldn’t the FDA guidelines be the best to use since they should be the most stringent? Some of these guidelines for mapping temperature bring up continuous environmental monitoring. Will I be required to do that? With all these guidelines, there must be something more specific on how to prepare and conduct a humidity and temperature mapping? Click here to download the Technical Note.